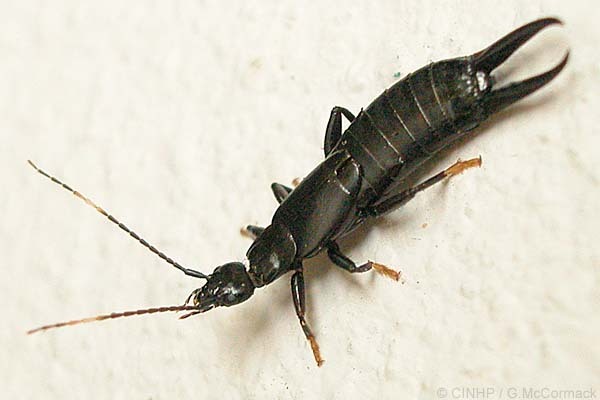 KEY FEATURES: Slender, glossy black insect, to 20mmBL. 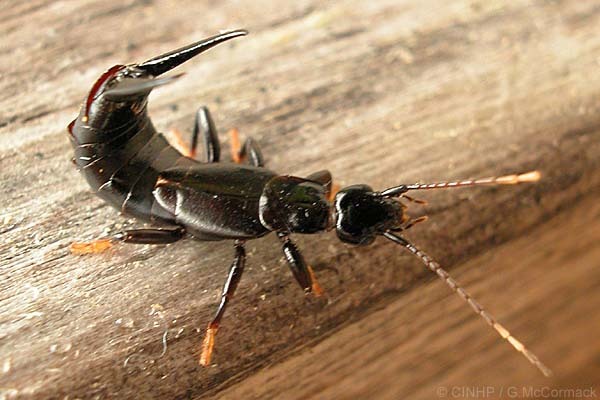 COLOUR glossy black; ANTENNAE w/wo two pale segments near tip; FEET (=tarsi) yellowish. FORCEPS (=pincers, = cerci) function variable: holding prey, folding the wings, defense, courtship. Readily fly. YOUNG more extensively yellowish. Pukapuka: fieldspecimen+photo, 2/2004, G.McCormack with ID as Chelisoches morio. Special Reference: Hudson, L. (1974) Dermaptera of Niue Island, and material from the Cook Islands. NZ J. Zool. 1(1):45-49.